Coming at You by artist Chris Harman. 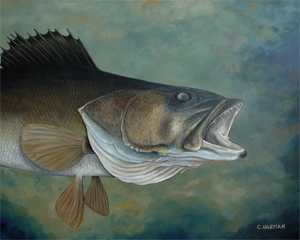 One of a series of oversized fish paintings done for an exhibit at the William Bonifas Art Center of Escanaba Michigan during the Cabelas National Walleye Tournament on Little Bay De Noc in June of 2004. 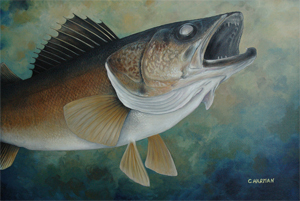 This painting is 20" tall by 16" wide and is the smallest of the five walleye paintings. Feeding Frenzy by artist Chris Harman. One of a series of oversized fish paintings done for an exhibit at the William Bonifas Art Center of Escanaba Michigan during the Cabelas National Walleye Tournament on Little Bay De Noc in June of 2004. Also this painting is the month of May featured picture in the 2008 Michigan Outdoor News Sportsman's Calendar. Looking Up by artist Chris Harman. One of a series of oversized fish paintings done for an exhibit at the William Bonifas Art Center of Escanaba Michigan during the Cabelas National Walleye Tournament on Little Bay De Noc in June of 2004. 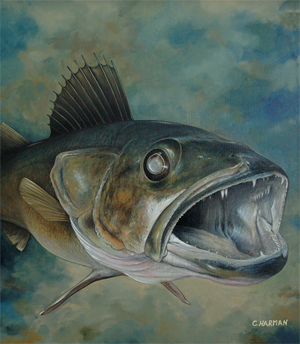 Striking Walleye by artist Chris Harman. One of a series of oversized fish paintings done for an exhibit at the William Bonifas Art Center of Escanaba Michigan during the Cabelas National Walleye Tournament on Little Bay De Noc in June of 2004. The Chase by artist Chris Harman. One of a series of oversized fish paintings done for an exhibit at the William Bonifas Art Center of Escanaba Michigan during the Cabelas National Walleye Tournament on Little Bay De Noc in June of 2004. 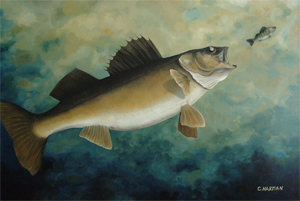 This painting is 4 foot tall by 6 foot wide and is the largest of the five walleye paintings. 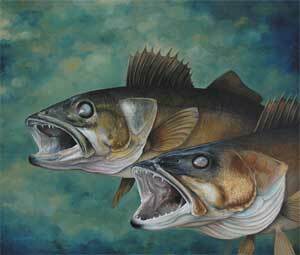 This painting was being stored in Escanaba until the opening day of walleye season for 2007 in Michigan. My friend John Fishback picked it up that day and brought it back to a local gallery in my home town. He was telling of how he caught the biggest walleye of the day.